Havis, Inc., as an industry leader in designing and manufacturing computer docking and equipment mounting solutions for mobile applications, participates in producing whitepapers intended to provide facts, figures and interesting perspectives in order to assist readers in making educated and informed business decisions in their role. Havis has released a new whitepaper to guide fleet managers through the process of upfitting and installing in-vehicle equipment to maximize driver comfort and safety, and increase productivity for a positive return on investment. Havis’ “Professional Installation and Upfit Guide for Fleet Mobility” details steps for planning and executing an in-vehicle upfit, including selecting equipment to build a custom mobile office solution that fits a fleet’s needs and budget; choosing a professional installation partner to provide expertise through the process; and best practices for project management so that equipment is installed both correctly and efficiently. The "Professional Installation and Upfit Guide for Fleet Mobility" provides the framework needed to create customized fleet strategies. The new whitepaper is designed to help professionals better understand and communicate their needs, and develop a strategic plan for new vehicles, fleet refresh or equipment upgrades. The whitepaper also includes a useful checklist for selecting a professional installation partner based on reputation, quality, capabilities and added value offers. 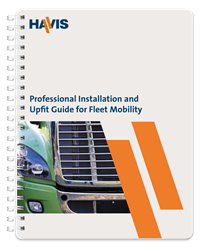 Visit http://www.havis.com to download a free copy of Havis’ “Professional Installation and Upfit Guide for Fleet Mobility.” For more information on Havis equipment mounting solutions, visit http://www.havis.com/products.htm or contact your Havis representative. Havis Inc. is a privately held, ISO 9001:2008-certified company that manufactures in-vehicle mobile office solutions for public safety, public works, government agencies and mobile professionals. For more than 80 years, the Havis mission has been to increase mobile worker productivity with industry-leading products that are built to the highest safety and quality standards and are designed with comfort in mind. With headquarters in Warminster, Pa. and an additional location in Plymouth, Mich., Havis currently employs 250 people.